How many times have you heard the expression: Eat a healthy diet and exercise for wellness? Well, that maxim is missing something—sleep! Sleep, glorious sleep, is the time when our bodies work to repair all the damage we've done to it throughout the day. Anxiety, depression, stress, poor diet, lack of exercise, or irritation caused by your partner's steadfast refusal to pick up their dirty socks (you know who you are), all can interrupt a healthy sleep pattern. Kidding aside, sleep is one of life's true restorers and we don't want you to miss a wink. 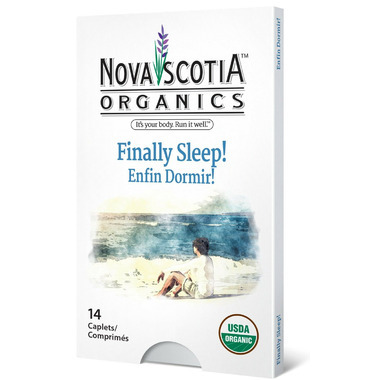 The Nova Scotia Organics Finally, Sleep! formula includes Valerian, traditionally used for mild anxiety, depression, stress and insomnia. Published studies show significant statistical benefits of improved sleep with Valerian, without adverse effects. Finally, Sleep! also contains Lemon Balm, which has been used historically for its sedative or tranquilizing effect. The combination of Valerian and Lemon Balm has also demonstrated to result in an improved sleep quality. Chamomile's tiny daisy-like flowers aren't just pretty in your garden, but have been used for sleep disorders and anxiety for centuries. It also make a tasty tea, (or more properly, a tisane). And Ashwaganda is often taken for stress. Add all these together and you might just believe that the Nova Scotia Organics Finally, Sleep! 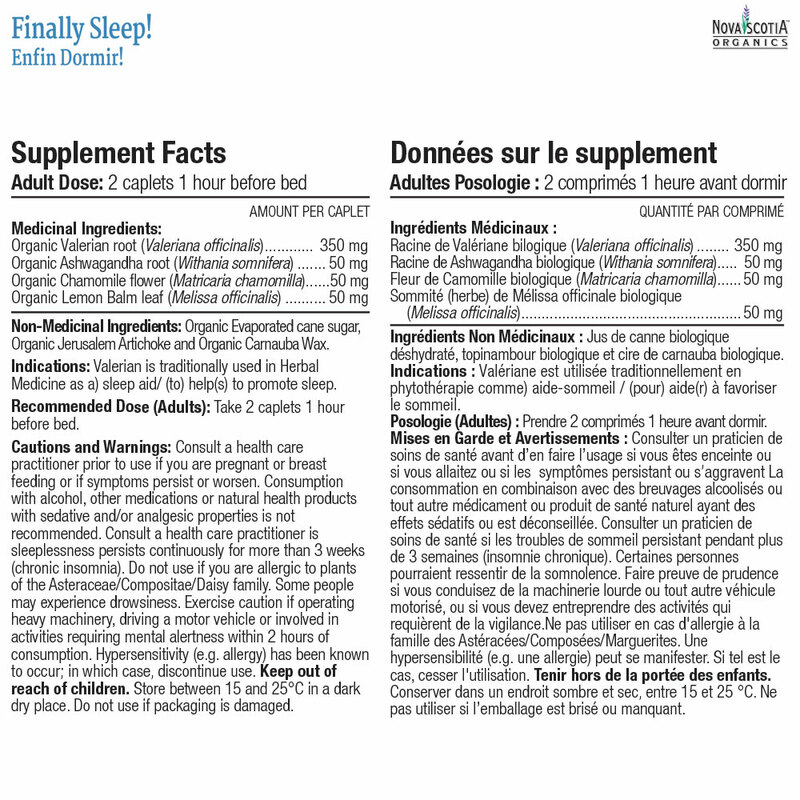 formula is just what the herbalist ordered as an antidote to mild sleep problems, and it's non habit forming. How to Use (Adults): Take 2 caplets 1 hour before bed. Cautions and Warnings: Consult a health care practitioner prior to use if you are pregnant or breast feeding or if symptoms persist or worsen. Consumption with alcohol, other medications or natural health products with sedative and/or analgesic properties is not recommended. Consult a health care practitioner if sleeplessness persists continuously for more than 3 weeks (chronic insomnia). Do not use if you are allergic to plants of the Asteraceae/Compositae/Daisy family. Some people may experience drowsiness. Exercise caution if operating heavy machinery, driving a motor vehicle or involved in activities requiring mental alertness within 2 hours of consumption. Hypersensitivity (e.g. allergy) has been known to occur; in which case, discontinue use. Keep out of reach of children. Store between 15 and 25 degrees celsius in a dark dry place. Do not use if packaging is damaged. Non-Medicinal Ingredients: Organic Evaporated cane sugar, Organic Jerusalem Artichoke and Organic Carnauba Wax.